The Rockboard Scooter is sturdy and durable making it easy to ride and built to last! It also folds quickly and easily for easy transport and storage! Whether you have a mini van, pickup or compact car - you can take it with you wherever you go! Oh the joys of being a parent of two children who love speed and adventure and who have no fear! The Rockboard Scooter is sure to be a hit among children of all ages - including adults. The biggest difference between the Rockboard Scooter and all the others is the fact that the Rockboard is actually 2 scooters in 1! That’s right. Not only can you shred the pavement in “Rockboarding” mode, but with a few simple steps, you can transform the Rockboard Scooter into a low-profile kick scooter machine! The Rockboard Scooter is made out of aluminum and has two large wheels with urethane construction. It carries a maximum weight of 200 lbs. Propulsion is achieved with each rock, wasting zero energy and allowing the scooter to reach speeds up to 10 mph. The patented Rockboard Scooter comes fully assembled and can be folded to a compact size for easy storage. 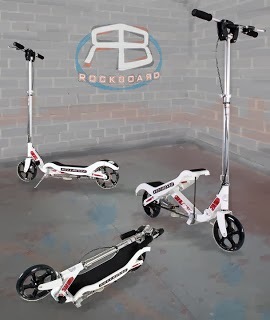 The original Rockboard Scooter is recommended for kids ages 8 and over, while the mini Rockboard Scooter is recommended for kids ages 5 and over and up to 90 pounds. You can buy the Rockboard Scooter online at Target, Amazon and Toys R US for $199. This giveaway will end November 25th at Midnight EST. 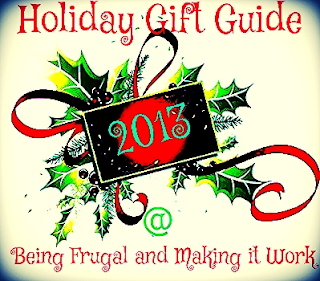 Disclaimer: The Being Frugal and Making it Work family received a complimentary Rockboard Scooter for the purpose of writing a review and hosting a giveaway. Regardless, I only recommend products or services I would use personally and/or believe will be a good fit for my readers. The views and opinions expressed on this blog are based purely by our own experiences. No monetary compensation was received. Results may vary. I really like The Rockboard Mini, and I know the kids would have so much fun with this and is without kicking, batteries or gasoline. I'd love to have the Rockboard Mini, as well. This is such a neat scooter that my grandson would enjoy! The Descender is awesomely cool! --To use some of my kids' language! :) Really, I've never seen anything quite like it. I'll bet it's really fun to ride. I like the original Rockboard in blue and I would give it to my grandson, who has been wanting a scooter. I like the Rockboard Mini, a smaller-kid version of the Original. I have two boys that this would be perfect for. I looked over the products and I love the Rockboard radiate the most. It has colorful lights to not only look cool but also be safe! My son really wants a skate board. He keeps asking for one. I think the descender looks pretty cool. I also really like the Rockboard mini. It would be perfect for my youngest daughter! I really like the Descender to give to my stepson, but I have to admit it does scare me a little. I can almost imagine a broken bone already. But, I bet he would have fun with it. Thank you. Another item I like is the Mini in Pink. Oh this would so be for my niece. I like the Rockboard Descender. I would like to give this to my son as a Christmas present. I also think The New Rockboard Radiate Skateboard looks like something my sons would love to have. My son loves to skateboard and I am sure he would love the Rockboard Radiate or the Rockboard Original Scooter. I know oldest son would love the Descender skateboard. It's hard to skateboard on rough surfaces because it messes up your wheels. This would be fun to give a try. I am loving the RockBoard Radiate. I think it would be the perfect board to ride at the skate park at night! It looks incredible. I love the Rockboard Radiate. I've never seen a skateboard like that before. It's awesome. I'd give the prize to my nephew for Christmas if I won. I would like one of the RADIATE skateboards my daughter loves to ride in the night in our cul de sac so these lights would make her the coolest RIDER around. Oh man...the RADIATE is awesome! I want that for me, but since I can't use it, I would love to watch my nephew on it. I love it, and know he would, too! The ROckboard Descender looks awesome! They all look like they would be a blast though and my son would love everything on their site! I like the Rockboard Mini. My son would enjoy the mini. I like that they made a mini size. I also think the Rockboard Mini would make a really fun gift. I would give it to my nephew! This scooter or the rockboard mini scooter would make excellent christmas presents for my kids this year. I like the Rockerboard Radiate. Who wouldn't like lights under their skateboard? My son would love this. I also love the Rockboard Radiate (the lights are so cool!) and I would give it to the family I babysit for for their son and daughter to share! We love being outside and these boards would make our play even more fun :) Thanks! I'd like the Rockboard Radiate for my grandson. He would love the lights on it and just having a skateboard! I would get the Original Rockboard in black on pink for my daughter, the orange Rockboard Radiate Skateboard for one son, and the Descender for my other son. I like the Descender. I have never seen anything like it. I watched the video and it's amazing. I like the rock board mini and I would give it to my daughter she would love to zip through and ride instead of walking. I think the Rockerboard Descender looks pretty awesome. It would be a great unique Christmas gift for my nephew who is really into skateboards. The rock board Radiate looks like a cool product. My son would like it too. Thanks for the chance! The Rockboard Radiate Skateboard would be great for my son. Thanks. I like the Rockboard Radiate, and this would be for a good friend's son. my daughter would love the rockboard mini, would make a perfect Christmas gift under the tree!! I really like the Rockboard Radiate! I think my son would really enjoy riding this! It would be an awesome gift for him! Josh likes the rockboard mini as well and of course, this would go to Josh. What a great review and product to offer. I like the Rockboard Radiate.. this would be the big present I couldn't afford! The Rockboard Descender is really cool! I love the wheels and great it would work on hills. I would give it to my cousin. They all look really fun, but I actually think the Original would be best for our family so both of my girls could use it! My stepson would love the Rockboard Original. He has been asking for something similar to this and we have debated on getting it. It looks super fun though and I am sure he would love it. My daughter is 8 years old and LOVES all things that are awesome and the Rockboard obviously meets those standards. I'm positive she would love the mini or original and I love that it is made to last unlike most products. The best part of Rockboard is that she is not just going to grow off from it. The Rockboard will get used longer do to the manufacturing and she will want to use it even as she gets older. My kids would both love Rockboard Descender but I know that they would be over joyed with this scooter they would be fighting over it lol but this would make them happy. I think that my daughter would like the Rockboard mini. I think it would be perfect for her. I would also love the Rockboard Mini for my daughter! I would get the RockBoard Mini for my daughter. She is very energetic and sporty, and although she is only 4 years old, I think she would really enjoy it. It looks like the perfect toy for her and the color choices are great.